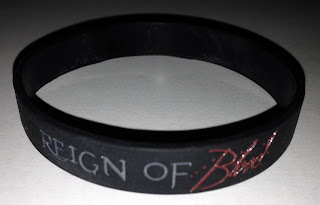 I get blood letters all the time asking when I'll bring back Reign Of Blood merch. I had a Cafe-press site setup a while ago, but those sorts of things never work out very well. I hate not being able to control the quality of the items. Today, I'm taking a step forward bringing a few things back. I'm not going to be opening a full on merch store filling my office with hundreds of tshirts, but I'd like to be able to supply a few little things which are cool - like wristbands. Over the last month or so I've been talking to a couple local companies in getting some stuff made, after looking at the selection, I thought wristbands are a good place to start. I've been wearing one for the last week or so, and even got a "I know that site!" comment. The bands are really good quality (I didn't cheap out and getting the lowest price possible), they're embossed and inked. I've added a new "merch" section on the BUY VIP/PLASMA page. Although only wristbands are available at the moment, if there are demands for other things, let me know, and I'll see what I can do. The price includes worldwide shipping. So the price you see is all it will cost you. More information is available on the merch page, check it out and get yourself one. Thanks again for entering, and hope the winners enjoy their plasma. tshirts, coffee mugs, stickers buttons would be my ideas. Staff bobbleheads. I will not back down on this. Shot glasses!! There are too many drinkers on RoB to not give us a shot glass to flash around when we're having fun!